The increase in popularity of online shopping is undeniable. This method offers us a wide range of products that may not even be available in the area where we will live and allows us to make purchases in a practical and comfortable way. All we need is a computer or any other smart device with internet access. Buying ham online can be a challenge. While it's possible to easily find the product we want from the comfort of our own home, we're still going to give you a few tips to make this process as safe as possible depending on our needs. Online ham stores offer us several benefits, the main advantages for the buyer are: the ability to compare prices and the features of the products for sale; the ability to make purchases conveniently from home without having to go anywhere, receiving the ham from different parts of the world, including those products that aren't available in physical stores. Likewise, there are also some disadvantages: by not having the product in front of us, we have less control over its selection and transportation; in some cases, due to a lack of information on the subject, we may be unsure of certain things such as the secureness of the online payment method, which isn't a problem in a physical store. Information and quality of the ham: breed, type of feeding, curing, among others. Clear purchasing conditions: price, transportation, taxes, payment methods and delivery time. Company: name and address, telephone, email, contact form, etc. Price: it shouldn't be way below or way over the average consulted value. Security regarding payment and confidentiality: personal data must be provided with a secure connection, in which case the image of a closed padlock is usually shown in the browser and the page's address begins with "http://". An additional detail and security measure is to print out the purchase confirmation page and save the emails you've exchanged with the store. Initially, to choose the ham it's important to know what we are looking for and our available budget. 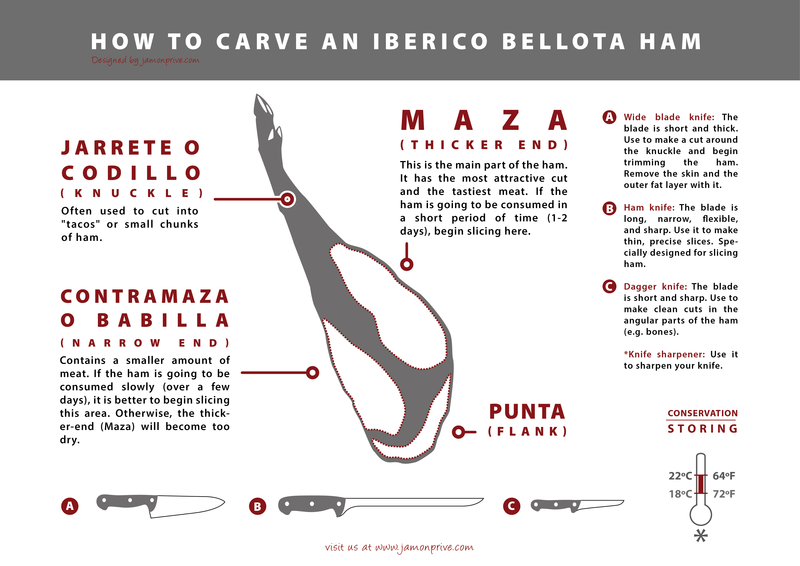 For example, if we want to splurge and get a good piece of black Iberian ham, which is one of the most exquisite and of the highest quality, we must take into account some specific characteristics that will allow you to recognise this product when looking at its photos: the limb is long, slender and has a dark hoof. Likewise, if the ham has a Designation of Origin, the mark of the Regulatory Council must appear. Later, once we have the product at home, we will proceed to examine it, making sure the flesh has a pinkish to dark red colour, a slightly fibrous texture with soft, shiny fat. The product's brand in some cases is an indicator of quality, some manufacturers have gained an honest reputation over time (some with over 100 years of experience), while others invest large sums of money in advertising. On the other hand, artisan manufacturers can offer high quality products that are relatively unknown because they have a low production. If you know little or nothing about the manufacturer, then you should choose a ham with a Denomination of Origin, since this means that its quality has been endorsed by a Regulatory Council and this agency can offer us information on the characteristics of the piece. Food should usually be transported under special conditions in order to prevent spoilage and thus receiving a product in poor condition. To do so, the store must provide you with information on the packaging and transport conditions, in addition to the estimated delivery time. 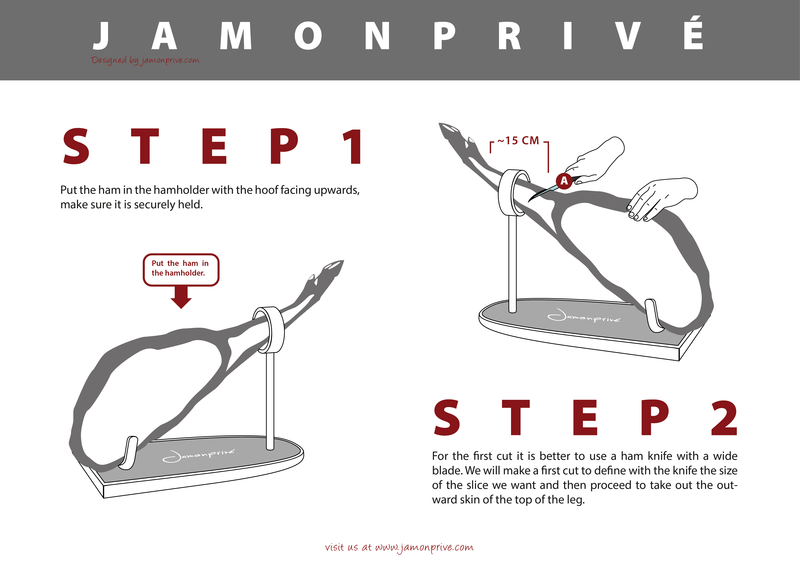 Ham, unless ordered without a rind, is not fragile or sensitive to transport conditions; however, it must be transported inside a cloth cover or a wooden or cardboard box and it must always be received with the packaging intact. When there are abnormalities or defects in the packaging, the store must be notified so that they can take the necessary actions, either by replacing the product or returning it. In view of the fact that the law does not require businesses to provide refunds with food products, and it is impossible to know for sure if a ham is salty or if it has an unpleasant taste without trying it, we recommend buying at stores that offer favourable return conditions. We also recommend checking that the return conditions are clear on the online store, if you can't find them then you can ask for them before placing your order, meaning we will therefore be given a detailed explanation in writing in the event that we encounter any future problems related to the order. Likewise, specific details should be clarified, such as: in which cases the return will and won't be accepted, and who covers the shipping costs, maximum return period, etc. 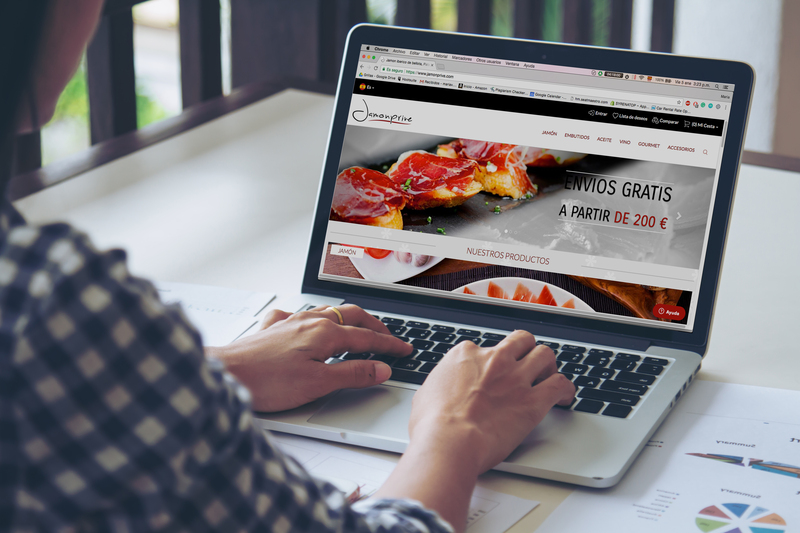 Once we've reviewed all of these suggestions, we can feel more confident when purchasing a good ham from an online store, being able to treat ourselves or give our loved ones a great gift with one of the best delicacies offered by Spanish cuisine!